I want to re-site the consumer unit in my garage so that I can install a "round the corner" garage door. Is there any rule that says the consumer unit has to be close to the garage door itself or can I get it moved to the back of the garage? At the moment the meter is to one side of the garage door with a separate isolator switch above it. 10 mm (I think) go from the isolator to the consumer unit which would need renewing and extending to the new position. What should an electrician do with all the cablles that exit the consumer unit to feed the house? Can they all be terminated in some sort of junction box and then continued to the consumer unit? That sounds like a mission and a half, with a job like that. Personally, I wouldn't like to see an Electrician use a heap of junction boxes to do a job like this, but at the end of the day, there are going to have to be some junctions made. Is there a possibility of moving the Unit to suit the runs of cable, to minimise the number of joints required?. Over here, you can pretty much put a Consumer Unit where you like as long as it's away from sources of moisture and it's easily accessible. I've shifted switch-boards here before and believe me, it's not a job I'd like to wish on anyone!. There's no specific requirement for the unit to be near the door. I agree with Trumpy that extending every cable to the new location with junctions is going to make it rather ugly, although likely to be quite acceptable from a technical point of view (there's just a slight chance that the extra cable length might increase voltage drop beyond limits on some circuits, but most unlikely in an average domestic system if you're extending by only a few feet). If you're lucky, some of the cable may take off in the direction you intend to move the panel (either in the garage or in the house on the other side of the wall), in which case you might be able to reroute and shorten them. If these are feeding the whole house, I would hope they're larger than that. 16 or 25mm would be the norm, depending upon the main service/fuse rating. There are just six breakers in the consumer unit and the job, I'm not saying it's easy, doesn't look too bad. I imagined some sort of enclosure with ALL the conections made inside it or even simply some sort of metal box with a door and separate junction boxes inside to tidy things up. The cables need to be extended by 12 feet so would this cause any problems with volttage drop? There are no restrictions on the siting of CCUs; barring the obvious of course!! The minimum tails csa is 25mm. Some utility's DO have regs concerning the maximum length of tails to the CCU ( along with their own minimum csa requirements ) you need to check that. Also they may want them in a trunk... Also, check on their requirements for the main earth bond, which for a 100A TN supply is always at least 16mm, with 10mm for the supplementary. 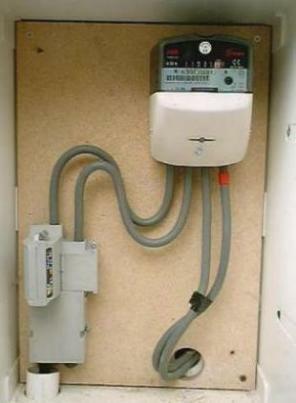 Some thoughts: If you are moving the meter, and you can; put it outside in a service box. You can ( though it sounds radical! ) if this is a cavity wall, blatter out the inner leaf and mount the wooden board on the inside of the outer leaf. I have seen it done - but I can't vouch for the building regs on that bit! Some utility's DO have regs concerning the maximum length of tails to the CCU ( along with their own minimum csa requirements ) you need to check that. A good point. Dave, you mentioned an isolator switch feeding to the existing unit. Is this a switchfuse? If so, then there shouldn't be a problem in this respect. Yes it is a 100 amp switch fuse. It is sited directly above the meter. Does this mean the cable from the switch to the consumer unit can be any length? No it doesn't. What it technically means is that, if that switch is located between the meter and the CCU, then any cable between it and the CCU is not 'bound' by utility requirements. Tails form a part of the consumer's installation, but must comply with the supplier's requirements. Where the protection is the supplier's cut-out this is obvious. However, where they are protected by an additional switch-fuse, rated the same as the cut-out, the same dimensions apply. The switch-fuse is deemed to be a matter of 'convenience' to isolate the whole installation, and not a "subsequent circuit". It may be that an individual supplier may not be fussed, however most would be; a tail technically becomes a submain if it has a switch in it, but this is rather academic. It is worth being mindful that your tail - with or without the switchfuse ( rated 100A ) - must be able to withstand a fault current of 100A. You would not be permitted to use cable less than 16mm in any case. That's an interesting point you raise. Just where is the set demarcation, between Consumer Equipment and Supply Authority Equipment?. As heavy-handed as this seems, anything up to the Line-side of the Main switch is SA property here, including the Tails. The meter and everything on the line side of it belongs to the PoCo. The tails which disappear into the wall (and up to the panel just above in this example) are supplied by and belong to the homeowner. As John said though, even though these tails are the property of the homeowner, the PoCo has specific requirements for them. If somebody just ran a pair of 4 sq. mm tails into the box, the PoCo would (or at least should) refuse to hook them up.